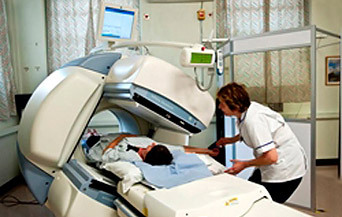 The RUH is the only hospital in the Bath area to have a Nuclear Medicine Department and all referrals will be scanned here. We are located off the top of the corridor between the Princess Anne Wing and the Main Hospital. A bone scan requires you to have an intravenous injection of a radioactive substance (MDP) which accumulates in areas of active bone metabolism. The camera passes in front and behind you building up an image of the skeleton. The scan takes around 20mins and is performed 3hrs after the injection. The radioactive dose received is less than a standard CT scan. You may need a scan like this to look for infection, stress fractures or cancer spread. This scan is made up of two parts. Ventilation (V) and Perfusion (Q). Approximately 75% of people will only require the Q scan. This involves an intravenous injection of radioactivity (MAA) which accumulates in the lungs. This allows us to assess the blood supply to the lungs and can be used to diagnose pulmonary emboli (blood clots). The V scan is done to complement the perfusion test and looks at the distribution of inhaled radioactivity. The dose of radiation received is around 1/4 of that of a CT chest. This is a common test to identify the nearest lymph node to a breast cancer which can then be removed to look for spread. You will have an injection of a low dose radioactive substance into the breast. You will then be asked to lean on the gamma camera for the images required to be taken. Following an intravenous injection of radioactivity, scans are performed of the whole body at 4, 24 and sometime 48 hours. This scan looks at uptake in neuroendocrine receptors which are all around the body and you may have a scan like this as part of your oncology management. This scan is used in the investigation of bile salt malabsorption. You will be given a capsule to take orally which contains a low dose radioactive substance. Scans are then performed at 1 and 7 days. The above list is designed to give you a flavour of the different tests we are able to perform but is by no means exhaustive. If the scan you require is not listed above please contact the department and we will be happy to advise you.